The ISI Group combined four US regional Fed indices with Markit Manufacturing PMI to create a comprehensive US manufacturing index (chart below). A pattern of growth starts followed by fairly sharp corrections emerges. Some have speculated that this volatility, at least in part, can be explained by the Eurozone uncertainty flare-ups: Greece (2010), Italy (2011), Spain (2012). The pattern also exists in the economic surprise indices (see post-1 and post-2). What's particularly concerning is that subsequent recovery has not been as strong as the previous "cycle". Businesses are becoming increasingly skeptical about spurts of growth. 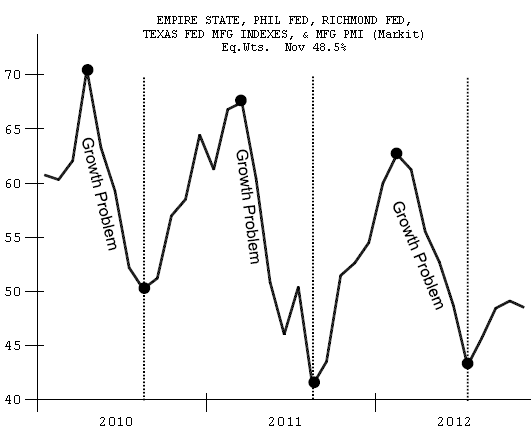 A similar pattern can also be seen in the ISM Business Confidence measure. Anecdotal evidence suggests that the current "cycle" will not go into its full upswing until there is clarity with respect to the US fiscal situation. But already some are talking about a strong first quarter of 2013 induced by Hurricane Sandy reconstruction expenditures - and then possibly another dip next summer, repeating the pattern once again. In the long run, this volatility in confidence is highly undesirable because it inhibits capital investment and hiring, forcing corporations to sit on cash (or pay cash out in dividends).